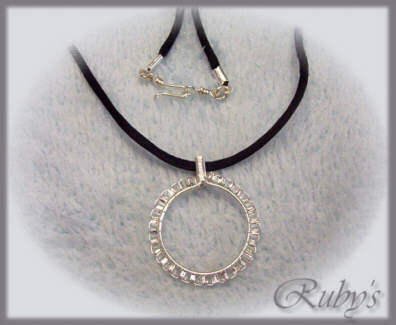 Here are larger pictures of the 3 pendants pictured on the tutorial page. 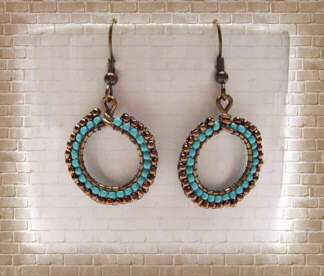 These 3 pair of earrings were made using a needle and thread (Fireline) to add the beads. 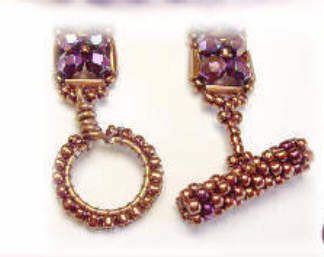 The first pair has just the one row of beads, and the second pair has an extra row brick stitched on. 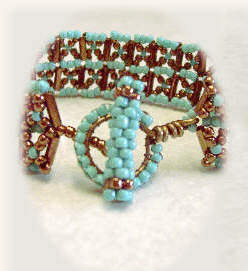 The last pair has several brick stitched rows, and I used the wrap wire to coil beads around in the center. 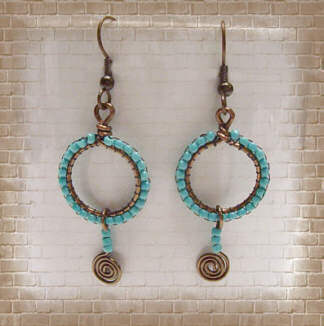 Here I made a smaller version of the hoops, with size 11.0 seeds to use as a loop for Peyote toggles. I used Fireline on these too. Add your pictures of your version of the wired hoop to this page! 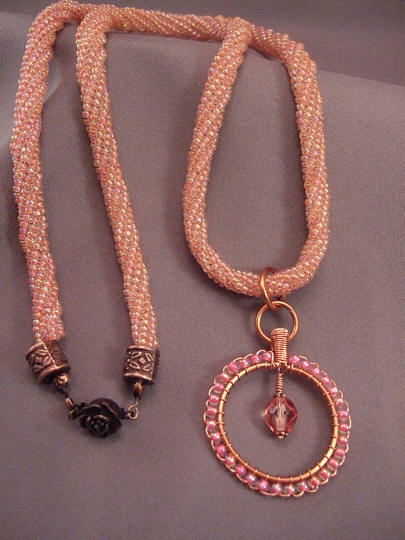 Just email the pics to me, along with info on what beads, wire, etc. you used. This is the latest one I've made. (I made the herringbone necklace a while ago.) 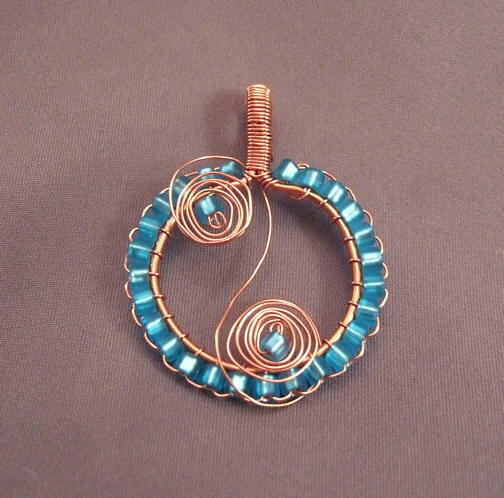 I made the pendant like in the tutorial, but after I was finished, I wired on the coil just for a little added something. :) Play around with the design, and see what you come up with! The circle can be a frame for all kinds of fun stuff! Take a basic tutorial, throw in some creativity and imagination, and what do you get? 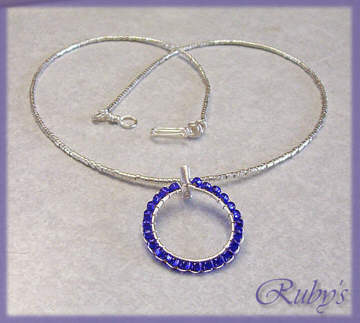 Maybe a gorgeous set like this one that was made by Sabina! 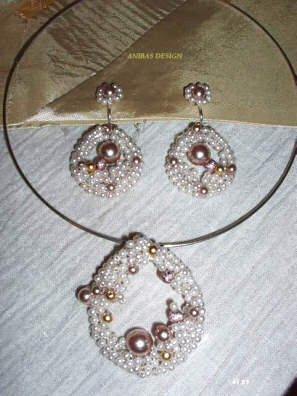 She said, " my jewelery design name is ANIBAS and i came from Croatia,city Zagreb. I have started with the round pedant tut and with the free stile( as i call it) ended up with the bubbles or Apstract romantic." I say, "Thanks for the inspiration Sabina! It's beautiful!" These two copper delights were sent in by Sam Hamilton. 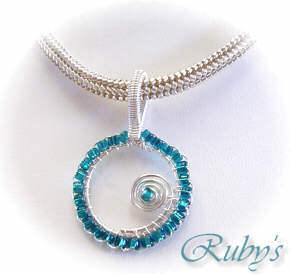 I love the free flowing swirly wire, and the other one is the perfect centerpiece to a beautiful rope. Thanks for sharing Sam!